Nothing says Spring like the sight of tulips in your local flower shop, grocery store or if you're lucky enough ....in your own garden. Here in west central Florida it is too hot to grow these beauties, so I must paint them. 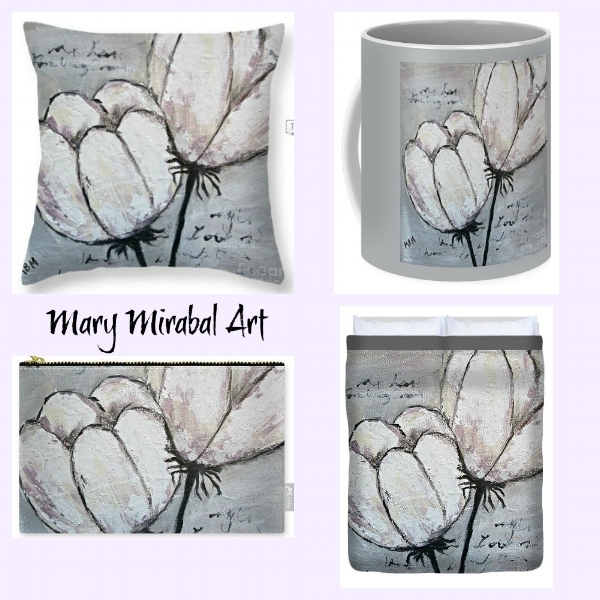 If you are a tulip lover you might want to check out the home decor items available with my Tulipe artwork. All available through my Fine Art America shop. Just click the photo below to see all the products available with this artwork. I hope you're inspired to bring home some tulips this weekend. They are sure to brighten up your home. Have a great weekend! Sign up with your email address to receive news and updates. You don't want to miss out! February "Steal of the Month"
Wow, it's hard to believe we're already halfway through the second week in February and Valentine's Day is just days away. In honor of February and it being the month of flowers, I thought a flower painting would be perfect for the "Steal of the Month". Introducing "Restless Ranunculus", a 10" x 10" acrylic on gallery wrapped canvas. Ready to hang with no framing required. It can be yours for a STEAL. This is a wonderful way to start an art collection, or add to an existing one. It's very simple to bid on this lovely original artwork. Simply click the button below. Have You Subscribed to My Blog?